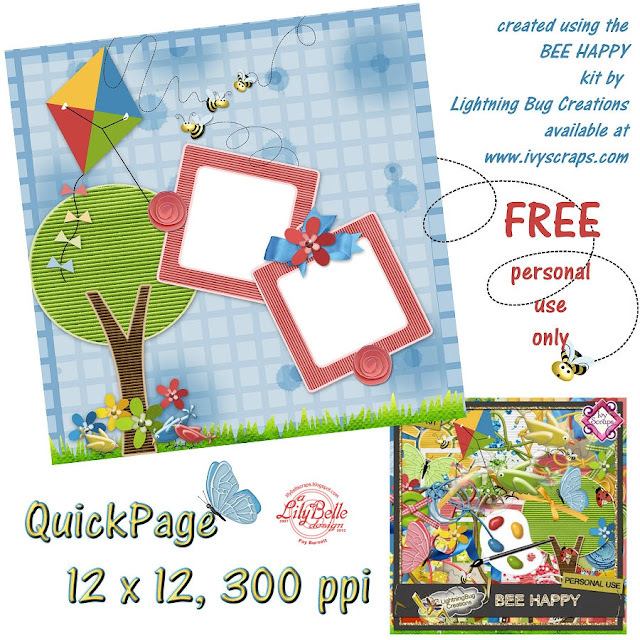 You may remember that a while ago I mentioned a QuickPage Contest at Ivy Scraps using a really cute kit by Lightning Bug Creations called BEE HAPPY. By making a quickpage for the contest I got the kit for free and am permitted to offer the quickpage as a free download. This kit is really easy to work with and has such appealing elements. It is available in Lightning Bug’s store at Ivy Scraps HERE. This is a preview of the quickpage I made and you may download it from MediaFire by clicking on the image below. Please note that this quickpage is for personal use only. THIS FREE QUICKPAGE IS NO LONGER AVAILABLE. ... just an after-thought ... I will be releasing a new kit sometime this week and, of course, there will be a freebie or two available here and in my store at Ivy Scraps ... SO ... stay tuned. This is such a delightful QP!! Thanks so much.